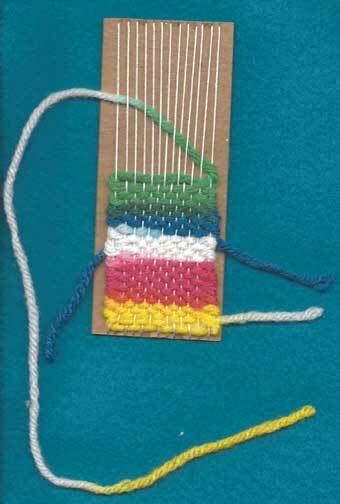 Make a handwoven bookmark simply and easily while learning the basic concepts of weaving on a cardboard loom. The bookmark makes a wonderful gift; or, maybe use it as a rug in a dollhouse or as a saddle blanket for a small toy horse. 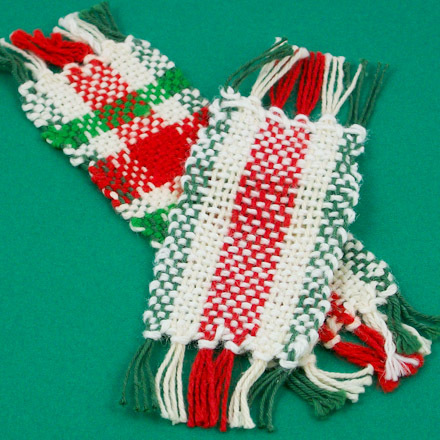 Make the loom in different sizes and sew the resulting fabric into coin purses, coasters, hot pads—whatever you can imagine! Weaving is usually done on a loom: a device for holding threads/yarn taut. Looms can be as simple as a piece of notched cardboard to something as complex as the big, fast, mechanical, computer-driven looms in cloth factories. For this project, we will use a simple notched cardboard loom. 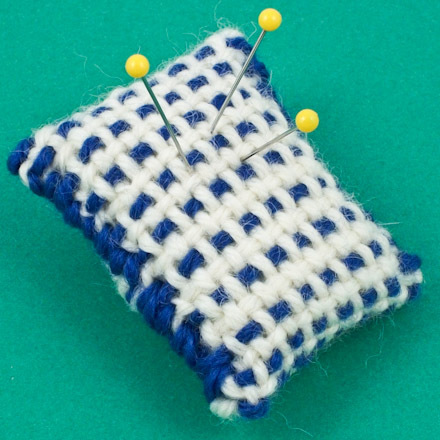 Related craft: Make a pincushion using fabric woven on a cardboard loom. See how in the Weave a Pincushion craft project. Cut a piece of cardboard 2" by 5" (5cm by 12cm). Use cardboard that is medium to heavy in weight—tablet	backs work well. Starting about 1/4" (6mm) from the left edge, make 13 marks 1/8" (3mm) apart on one short edge. Repeat on the other short end. Snip the cardboard about 1/8" (3mm) in at each mark. These are the slits for the lengthwise threads (warp). Project extra: Download Aunt Annie's printable pattern for cardboard looms to use as an aid in making a cardboard loom. Use the loom templates to cut the cardboard to size and as a guide for making the marks for the thread slits. First, lengthwise threads are put on a loom. These threads are known as the warp, and the process of putting them on the loom is called warping the loom. We will warp the cardboard loom with string. Tape the string end to the back of the cardboard. Starting from the left, wrap the string around the cardboard 13 times, being sure to catch it in each notch at the top and bottom, and in turn left to right. After going through the last notch, tape the string on the back of the cardboard and cut it from your ball of string. Next, you will weave the yarn, also known as the weft, into the string to form the bookmark fabric. Thread the yarn needle with a length of yarn no longer than your arm. Starting at one end of the cardboard, weave the yarn into the string by going under then over the strings all across the cardboard. Pull the yarn through the string, leaving a 3" to 4" (7-10cm) tail. Use the comb (or fork) to push the yarn down to the bottom of the string evenly. Now go back the other direction, but weave over then under the strings. Pull the yarn completely through, but not too tightly. Push the yarn down on top of the last row with the comb. Continue weaving back and forth, alternating the rows under then over and over then under, for the entire length of the cardboard. Try to make your edges, also known as selvedges, straight and even. You will need several lengths of yarn to complete the bookmark. Leave a 3" to 4" (7-10cm) tail at the beginning and end of each piece of yarn. When you start a new length of yarn, start it two or three warp threads back from where the last yarn length ended—so that they overlap a bit. 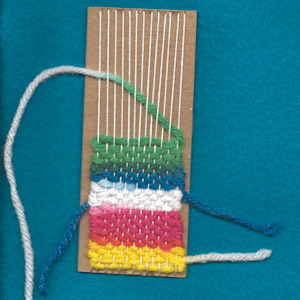 Leave all the loose ends on the back side of the bookmark—under the fabric being woven and next to the cardboard. The loose ends look messy now, but later we will hide them. Cut the warp threads on the back of loom in the middle. Pull the threads from the notches 2 or 3 at a time, and tie a knot as close to the yarn as possible. Do this for all the threads at each end of the bookmark. If needed, trim the strings to make an even fringe at each end. 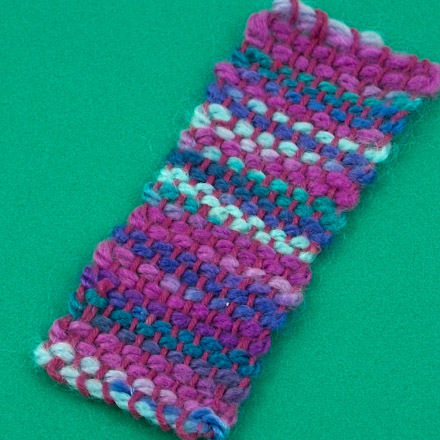 To hide a loose yarn end, thread it through the yarn needle and weave it into the bookmark a few times— try to make it invisible. Snip the loose end as close as possible to the fabric. Repeat the process for each loose end. That's it! Your bookmark is done! 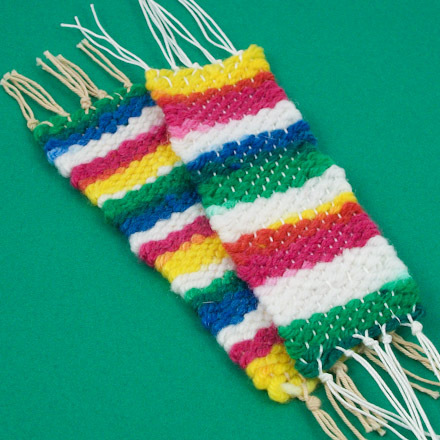 Tip: Make bookmarks with stripes and plaids by using multiple colors for the warp threads and using weft threads of the same weight. For stripes, use one color for the weft, and for plaid, weave stripes in multiple weft colors. 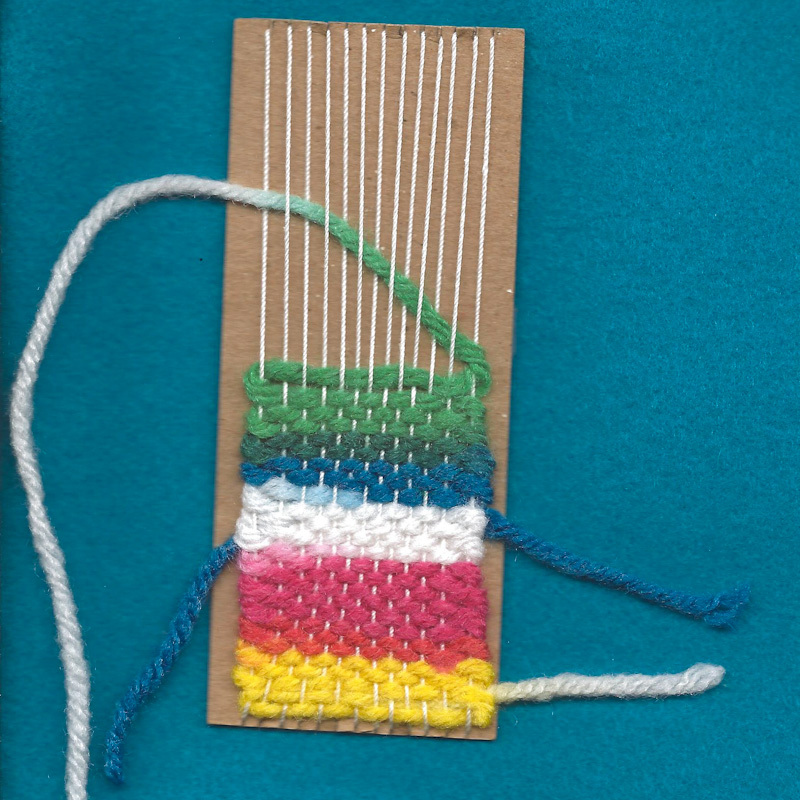 Tip: Use a colored warp for the handwoven bookmark. Tip: To make a pincushion, form a tube with the bookmark fabric, stuff it, and sew the sides closed. See how in the Weave a Pincushion craft project. The checked look is created by alternating white and blue weft threads.